On the eClass Overview page, click the yellow button on the top right screen, "Customise this page". To show or hide courses, click the eyeball. Hidden courses are grayed out and its respective icon shows an eyeball crossed out. To reorder your course list, drag-and-drop the courses into the order preferred by using the drag-handles indicated by a multidirectional arrow. Click "Stop customising this page" when finished. 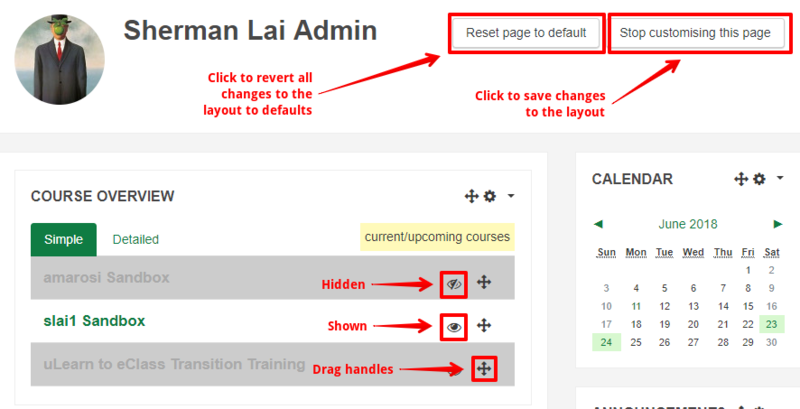 The 'Reset page to default' button will revert all layout customisations (item order, blocks, visibility, etc.) in your eClass to default settings. Hiding a course from your Course Overview list DOES NOT hide it in the left-hand Navigation block.